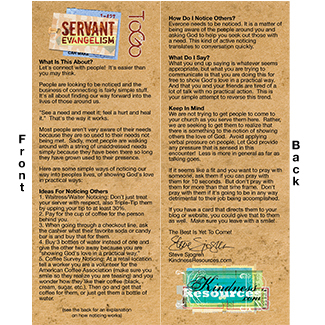 Our SE-To-Go cards are a great tool to help your people answer questions when they are out and about serving, questions such as: "What is This About?" "What Do I Say? ", "Keep In Mind" and "Ideas for Noticing Others". This great, little bookmark-sized card is approx 2" X 5.5" and comes with a glossy finish to withstand any weather you might face.